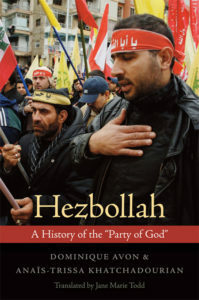 Dominique Avon & Anaїs-Trissa Khatchadourian, Hezbollah: A history of the “Party of God” (translated by Jane Mary Todd), Harvard University Press, Harvard, 2012, 256 pages. For thirty years, Hezbollah has played a pivotal role in Lebanese and global politics. That visibility has invited Hezbollah’s lionization and vilification by outside observers, and at the same time has prevented a clear-eyed view of Hezbollah’s place in the history of the Middle East and its future course of action. Dominique Avon and Anaïs-Trissa Khatchadourian provide here a nonpartisan account which offers insights into Hezbollah that Western media have missed or misunderstood. What happens when an organization founded as a voice of “revolution” and then “resistance” occupies a position of power, yet witnesses the collapse of its close ally, Syria? How will Hezbollah’s voice evolve as the party struggles to reconcile its regional obligations with its religious beliefs? The authors’ analyses of these key questions—buttressed by their clear English translations of foundational documents, including Hezbollah’s open letter of 1985 and its 2009 charter, and an in-depth glossary of key theological and political terms used by the party’s leaders—make Hezbollah an invaluable resource for all readers interested in the future of this volatile force. This entry was posted in Publications and tagged Avon by Jean. Bookmark the permalink.